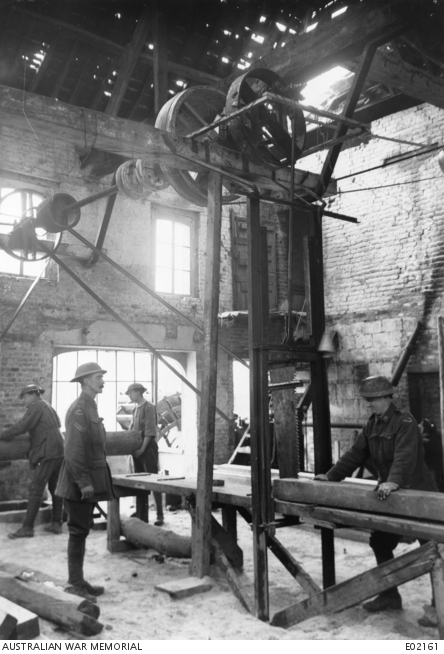 A portion of the workshop fitted up in an old mill on the canal by the 3rd Pioneers Battalion. Power for an electric motor was supplied by the water wheel seen beyond the door. Identified, left to right: 205 Private (Pte) W. J. Graham; 1502 Corporal W. Allen; 2918 Pte J. G. Walters; 2757 Pte H. J. Bull.